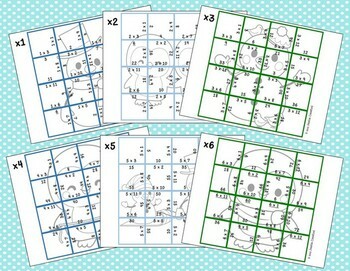 Multiplication Picture Puzzles are a great way for your students to develop multiplication fluency with products up to 144! 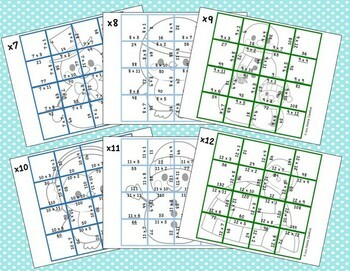 12 puzzles are included in this set with each one focusing on a factor from x1 to x12. Each puzzle is made up of 16 squares with factors and products along the borders. 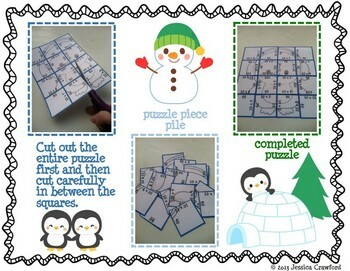 A winter-themed picture is also located within the puzzle. Solving the puzzle to see the picture is the best part! Once the puzzle is cut apart, the student(s) must then match up the factors to the correct products on all sides. 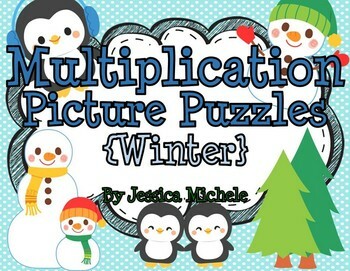 As all multiplication facts are represented twice in each puzzle, the lines of the winter picture help to reinforce the correct answers and placement of the puzzle pieces. No multiplication facts are located along the outside of the puzzle to also help reinforce correct placement. To Assemble: Print, laminate, and cut out! If necessary, Velcro could be attached to the backs of the puzzle pieces and younger students could put the puzzles together on a felt board. To Use: Place at a math center for a student or small group to put together independently. Make sure you don’t tell them ahead of time what the picture is!